By the end of 16th century infantry-ashigaru become full-fledged professional soldiers. Since 1591 the Decree on the division of the estates they are officially defined as the lower strata of the samurai class. The most dedicated and courageous ashigaru could merit to get the highest rewards and reach the highest positions of samurai. 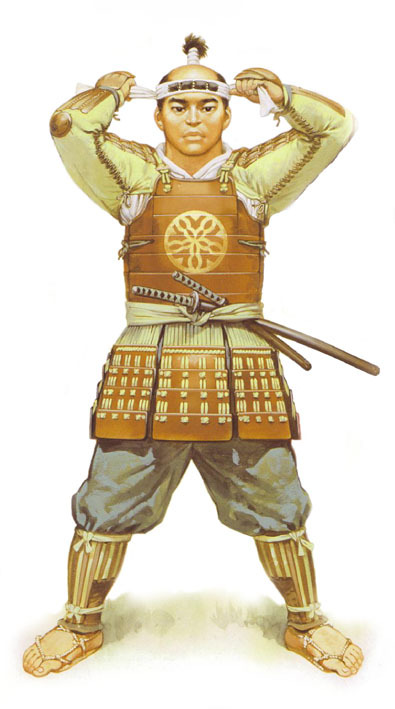 Ashigaru, Acting-bearer in the army daimyo, had great potential to become famous in battle. He was also the most vulnerable. Kill Ashigaru-bearer was considered a nice feat, comparable with a decent head obtained by the Samurai. Ashigaru dressed in standard armor okegawa-up, covered with light brown varnish. Front and rear with gold paint caused the Mon lord. Cloak (kote) is a common fabric sleeves with sewn on them lacquered metal plates. Stuffed in his belt are two swords as a sign of belonging to the samurai class. Bandage on his head hatimaki of white cloth with four black metal plates. Driven into the ground flag - Noboru, usually served to identify individual units within the army, or simply be imposed in large quantities for display of military strength in the face of the enemy. On a vertical white cloth with black family shows three mon Tokugawa Ieyasu (three leaf-stem roses, inscribed in a circle). October 21, 1600 in the bloody battle of Sekigahara Tokugawa Ieyasu defeated his rivals in the fight for sole power over Japan. 74000th Tokugawa army ("east") inflicted a decisive defeat 82000th coalition forces ("West"). As soon as the battle began, as many of the coalition forces began to move to the side of Ieyasu. A few hours later it was over, the coalition has lost about 40 killed thousands of people. The winner of Tokugawa Ieyasu in 1603 assumed the title of shogun and united all of Japan under his rule. Tokugawa shogunate, with its capital at Edo (modern Tokyo) rules over the next two and a half centuries, until 1868.